A poolside awning gives your home value, style and a cool spot to stay refreshed. Summer is the time of the year for fun in the sun, and there’s no better place to cool off than by your pool. Still, even the most sun acclimated skin needs a bit of shade on the hottest of days. Poolside awnings are the perfect solution, bringing value and style to your home in addition to a cool spot to keep refreshed. Here are a few reasons you should consider adding a summer awning to your patio or poolside area. A custom awning lets you enjoy the warmth of summer without shuttering yourself indoors. Awning fabrics are designed to block harmful ultraviolet rays and provide a durable, long-lasting structure to protect you from the sun and other elements. Poolside awnings make the most sweltering hot days more tolerable, so you can get the most out your summer. It’s always important to wear sunblock, but an awning will provide heat relief when you need it most. A poolside offers an excellent transition zone between your pool and your home. If your pool is off the end of your house or deck, an awning can expand your home’s living space into your backyard. A shaded area is much more comfortable for eating and having a cookout than with the sun blaring directly overhead. The additional shade will also bring your energy bill down as you won’t have to blast fans and air conditioning units. Outdoor furniture is often susceptible to sun fading, but with a poolside awning you can protect your furniture from the sun. 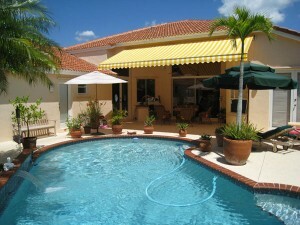 A poolside awning adds value to your home. Awning designs are virtually limitless, so with professional guidance you can find a poolside awning that matches the architectural style and design of your home. Custom awnings make use of specialized, handcrafted fabrics that can fit with your poolside decor. The right poolside awning will have you neighbors envious with questions. And with a retractable or freestanding awning you can adjust your awning to your home’s needs each season. Are you ready for summer with a retractable awning for your pool? The Carroll Awning Company provides the best quality, energy-efficient canopies, awnings, Sunesta shelters, and frames for any business, restaurant, home, or apartment. We design, create, and install custom-created canopies and awnings all year round!